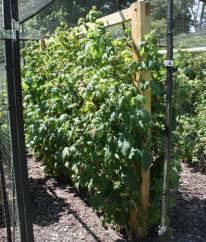 As Autumn raspberry plants get taller and stronger they will now need support from poles or a frame. 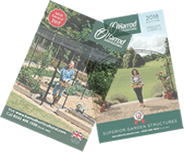 Harrod Horticultural have been specializing in fruit protection and growing frames for over 50 years and their exclusive product range is designed and manufactured in the UK. 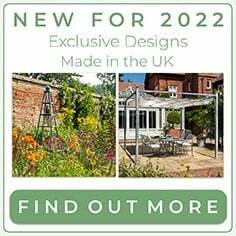 A FREE made-to-measure service is available for awkward slopes and sites, and specific size fruit cages in consultation with the Harrod Horticultural Research and Development team. 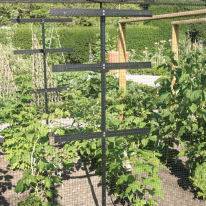 The exclusive T-shaped Raspberry Protection and Support Frame is a multi-use frame that acts as a plant support and protection system for raspberries, broad beans and peas. 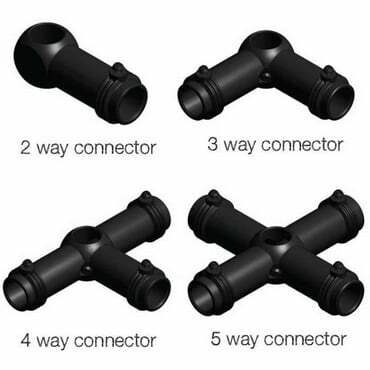 Available with or without heavy-duty black 20mm diamond mesh anti-bird netting. 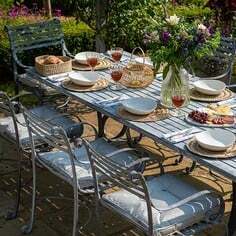 Each upright is made from heavy-duty galvanised steel with baked on powder coating with a top horizontal bracing bar included to strengthen the structure. 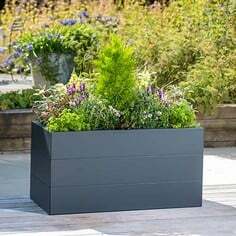 The support bars can be easily adjusted to four different heights to cater for your plants as well as more mature, established specimens. 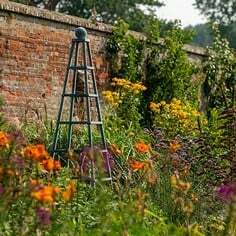 Each upright is supplied with 3 horizontal braces and plant support twine that runs through the holes in the bar to support the netting and plants. Self Assembly is required and the protection and support frame is available in two pack sizes - a pack of 2 supports protects an area 3m long x 1m wide x 1.7m high or a pack of 3 supports protects an area 6m long x 1m wide x 1.7m high. 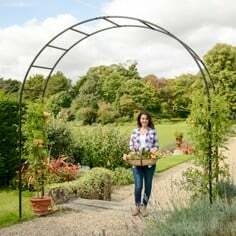 For raspberries already inside a fruit cage the Harrod Horticultural Timber Wire Frameis a fantastic way to encourage greater yields of cane fruit and other trained types of fruit trees and bushes both in the garden or vegetable plot or inside the safety of a fruit cage! The handsome design of wooden plant support frame brings together an incredibly strong steel cable wiring system with an especially sturdy timber framework - the wire support frame is ideal for cane fruit such as raspberries, tayberries, blackberries and boysenberries or for training fruit such as apples, pears and peach into espalier or fan forms.All Harrod Horticultural timber is high pressure treated to ensure a longer life. These posts are designed to be secured 40cm/16" into the ground and can be concreted in if required. 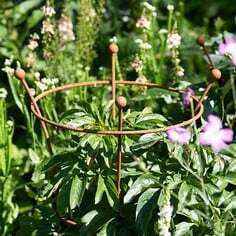 The timber plant support kit comes complete with 5 barrel strainers and fixings and the 65m of supplied steel cable easily allows 5 tensioned lines to be fixed between the posts at your desired spacing to offer optimum support for fruit laden canes and branches. The timber wire frame comes in complete kit form (both the frame and wire) and a wire cable kit is also available separately. To protect the precious harvest once fruiting begins the exclusive Harrod Slot & Lock® Economy Fruit Cage is the perfect value solution. 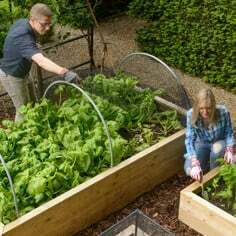 A superb 1.8m high walk-in fruit cage, especially for fruit and vegetable growers, providing a simple and cost effective way to protect your plants. The fruit cage kit uses strong 16mm diameter aluminium tubing and our exclusive award winning Harrod Slot & Lock® connectors, which are screwed firmly in place to create a sturdy fruit cage structure. 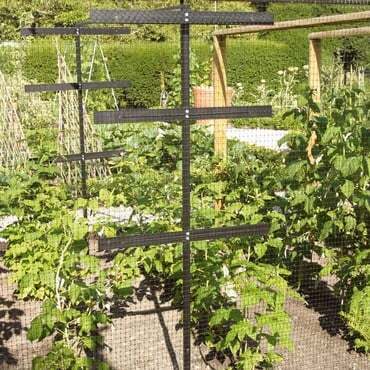 The fruit cage kit stands 1.8m high, includes braces for extra rigidity and has a Zip Net Access Strip which can be located anywhere on the netting for a convenient re-sealable entry for easy access to your crops. 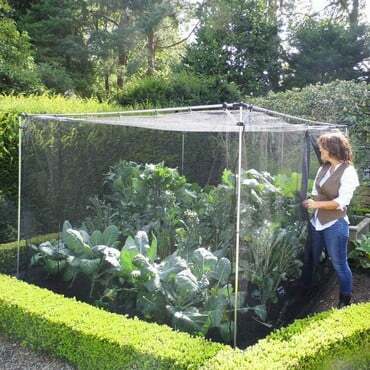 The fruit cage comes complete with 7mm x 7mm polyethylene side netting and 7mm x 7mm soft mesh butterfly netting for the roof which can easily be removed. 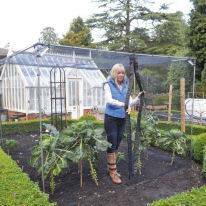 The cage stands 1.8m high - uprights insert 20cm/8" into the ground and the Harrod Slot & Lock® Economy Fruit Cage is available in 8 sizes. The framework of our aluminium fruit cages is manufactured from 25mm diameter, 1.6mm thick aluminium section which is where our claim to be the strongest aluminium fruit cage around originates. This thicker and tougher aluminium tubing - complete with flush fitting connectors - compliments the 16mm x 16mm square mesh extra heavy duty extruded side netting and the heavy duty, 18mm x 18mm diamond mesh anti-bird roof netting to provide an inexpensive but thoroughly dependable way of protecting your fruit bushes and vegetable plants. And finally don’t forget the raspberry beetle traps and monitoring kit in your fruit cage for all encompassing raspberry protection!